The Spinlock hook does NOT have to be side loaded to fail. 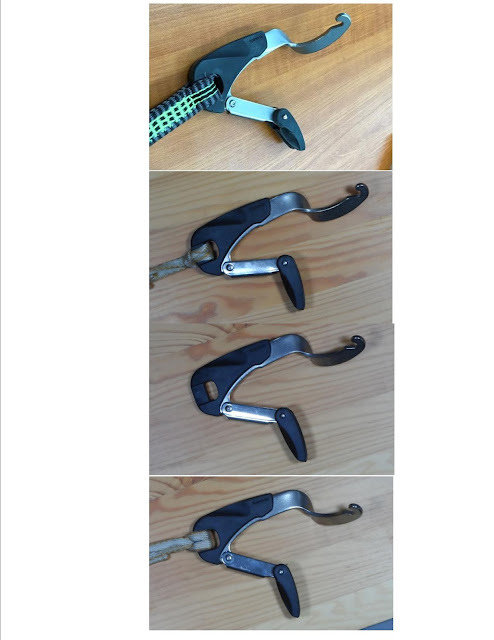 The top image is the failed hook. The lower images are hooks that were loaded with the webbing snagged in the gate, which can happen in several ways. They were NOT pried sideways. Last edited by thinwater; 09-02-19 at 06:04. What is interesting is that 67 people read the thread and did not post, so there was some interest and now over 400 people have read the thread and a few responded and with a few exceptions (for example Zoidberg) no-one has kept up too date on this. Not their fault - how would they know? The case investigated was a Brit on a UK yacht - the investigation was carried out by an American and published in an American magazine (Practical Sailor) (and I think an edited version, based on the PS work?, is available on AAC, Morgans Cloud subscription website.) There is a pending MAIB investigation - no criticism intended of the MAIB. There does not appear to have been any UK, nor Oz, release of a summary nor the current state of play. We are waiting to see how the industry responds - using 2 tethers is desperately inconvenient. We have kept upto date - and I wondered, given the absence of threads on the topic, what the UK's awareness was. And credit to Thinwater - its stunning work, why did the 'industry' not do all this? Last edited by Neeves; 09-02-19 at 06:22. So what tether hooks are recommended? And what tethers? Our canine crew uses his the most and the others rarely see an outing unless on night passage but certainly older than 2009 so welcome advice as to suitable source and make ? As they are for personal use and not commercial, I take the liberty of some latitude from rules and standards, especially to favour ease of use, wearing unwearing sleeping in it etc. Fwiw my last tether has a Kong Tango snap hook, though it does not snag, is certified, blabla, I am not totally happy as it is too big, I would change it with a smaller size one. Also making some tries for ways to modify the tether length, still working for a way of climbing back onboard alone, I have seen a couple of interesting experiments. Harness side I am toying with an above sternum attachment point. Last edited by Roberto; 09-02-19 at 10:29. Was it written: "ye shall rip what you sew"? You don't make it clear, but I hope you've bought links certified as PPE and not the cheapest galvanised POS you could find in the local hardware shop! Simply, by taking an interest and learning from well-publicised incidents. Reading MAIB bulletins and reports is a good start. Tethers that meet ISO 12401 are recommended. Also hooks meeting the via ferrata standard (UIAA 121 type K). These include The Kong Tango hook shown above and the Wichard Proline, and many hooks made for via ferrata climbing and industry. ICW Wales (an old UK company) makes some nice ones (SH 901 and SH 903), similar to Kong. The ISO tether standard includes a body weight drop test, which older designs generally failed. By the way, climbing slings will ALSO generally fail this test, because they are NOT designed to be used separately, only in combination with an elastic rope. It is well know that it is dangerous for a climber to clip directly to a sling if there is an slack in the system, and never to move upwards while so anchored. People have died that way. The Short coming of the ISO standard is that it does not include requirements for side load, nose hoking (sling caught in gate), or a force requirement on the gate being pressed open. These requirements have existed for climbing and industrial gear for many decades. The original Gibb hook, and the patent were drop forged. Google it. Then someone go the bright idea that it would be lighter and cheaper to stamp them out of stainless. That removed all lateral strength. The original Gibb was a safe design. Then it was ruined. * Nylon climbing webbing is too stretchy and not strong enough (it is meant to be used doubled). * Sewing to full strength is very difficult. Knots weaken 35-50%. * Webbing does not last in the sun. But does it make sense to be frogging around with jacklines in the dark or in a rising storm? Not really. So I choose something that will last in the sun. * Rope and cable are a prolem underfoot. Covering them with webbing helps. * Attaching them to cleats is all wrong. The last place the jackline should be is the far ends of the boat and the edge of the deck. Kind of obvious, but cleats are easy... just wrong. That is another reason the Clipper tether failed. The jackline was the wrong place.